to personal injury victims throughout the state of Tennessee and only get paid if we win. We have laws that protect employees from corrupt employers. you may need an attorney. The experienced lawyers at the Knoxville office of Greg Coleman Law are prepared to fight and protect our client's rights. With hundreds of millions of dollars in verdicts and settlements for class actions, personal injuries and related areas, let our attorneys put our experience to work for you. If you've been personally injured, injured in a car accident, hurt at work, prescribed a defective drug or sold a dangerous product we'll evaluate your case at no cost to you. And remember, unless we settle or win on your behalf we don't get paid. Auto accidents can have devastating effects on those involved, leaving some seriously injured, permanently disabled and in financial ruins. Causes of negligent vehicle crashes can vary from reckless or distracted driving, driving under the influence, texting and driving, speeding and head-on collisions. Get a free case review by filling out a form on our website or contacting us at (865) 247-0080. Bringing a class action lawsuit against a major corporation can be a daunting task and requires a lawyer with experience in these types of cases. Our firm has successfully tried and settled several class action cases. Contact us today to see if we can help you with your claim. Medical professionals have a responsibility to treat every patient with the highest level of care and attention. When these ideals are compromised, you may be the victim of medical malpractice. The medical malpractice attorneys at Greg Coleman Law handle various medical negligence cases, including birth defects, surgical malpractice, misdiagnosis and medication or prescription errors. If you have been a victim of medical malpractice, let the Knoxville injury lawyers at Greg Coleman Law represent you. Have you been denied social security disability? Are you not receiving the proper amount of disability benefits? The social security attorneys at Greg Coleman Law are here to help you with your SSD claim. If you need help filing for social security insurance (SSI) or social security disability insurance (SSDI), allow our disability attorneys to help you with your claim. We will work to help you get the SSI or SSDI benefits that you deserve. By filling out our free case evaluation form you will get your case reviewed at no cost and we only get paid when we win or settle. Call us now (865) 247-0080. 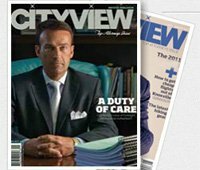 Greg Coleman has been awarded the prestigious "Cityview Top Attorneys", recognizing excellence in litigation in Knoxville, Tennessee. Greg's abilities have also landed him on the cover of the September 2009 edition. Selection to Best Lawyers is based on an exhaustive and rigorous peer-review survey comprising more than three million confidential evaluations by top attorneys. Because no fee or purchase is required, being listed in Best Lawyers is considered a singular honor. If you or someone you love has suffered a serious injury due to the negligence of another individual or as a result of a defective or dangerous product, you or that person may be eligible to file a lawsuit claiming damages. Contact us today at (865) 247-0080 and speak with one of our lawyers to discuss the merits of your potential lawsuit. Alternatively, simply click "HERE" and complete the complimentary "Case Evaluation Form". A member from our staff will contact you shortly after receipt of your inquiry.